This causes alternating vasodilation (dilation) and vasoconstriction (constriction) of the arteries and capillaries, and therefore causes vascular flushing. A marked increase in local circulation and venous return occurs. In one study reported a 30 minute contrast bath increased circulation in the lower body by 95%. This helps move waste products from exercise and sports, decrease swelling, and increase tissue healing. The greater the difference in temperature between the heat and the cold, the greater the effect on local circulation. Contrast treatment is great for self care! The alternating application of heat and cold is one of the most effective methods of increasing local circulation. This relieves stiffness and pain due to trauma and stimulates healing of an injury. Great for old injuries, sprains, strains and scars once they have passed the acute phase, also great for tennis & golfers elbow, and any hand overuse injuries. What you need: 2 x tubs – one filled with ice water, and one with hot water, and a helper. Immerse the body part in the hot water for 3-5 minutes (or until the water no longer feels hot). Remove the limb and place in the ice water for 30 seconds to 2 minutes (or until you get accustomed to the cold water). Repeat procedure 3-6 times, finishing with the cold water. 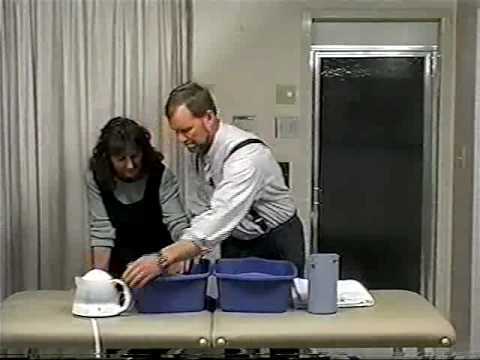 Get someone to help you to fill up the hot water tub with a kettle as it will get colder and colder from the cold limb. Do not attempt contrast bathing if you have nerve damage or decreased skin sensitivity. If you are wondering if contrast bathing would be suited for you, book an appointment with one of our Remedial Therapists for an assessment. TO BOOK WITH A MASSAGE THERAPIST: CLICK HERE! Resolutions – do we love them or hate them? People can ‘burnout’ too!